What If The iWatch Isn’t A Watch At All? What if Apple’s iWatch is’t an iWatch at all? What if it’s a spec, like CarPlay, that lets folks like Casio and Rolex put an Apple chip inside their watches to make them talk to your iPhone? Apple doesn’t have to get into the fashion watch game, or make “ladies” and “gents” watches. The watch industry gets a shot in the arm (pun intended) as watches get useful again. You don’t need a power-sucking display. The iPhone is the display. This is conjecture, based on an idea that came to me in the bath last night, but I think it makes some sense. Think of the iWatch as something like the Apple TV, which is not a TV. It lets you connect your iPhone to the TV. So maybe the iWatch is something that lets you connect your watch to your iPhone? 1) The M7 Motion Co-Processor doesn’t make that much sense inside the iPhone and iPad, so maybe Apple is just testing it in its most popular devices? An ultra-low-power motion-sensing chip does make sense in a watch, though, especially if it is still using the iPhone as the brains of the outfit. 2) Bluetooth 4 is at a stage where a device can run for months on a watch battery, and Apple’s iBeacon tech uses Bluetooth 4 to let tiny devices blip data to nearby iPhones. 3) Apple’s leaked HealthBook app suggests that the iPhone will aggregate all kinds of medical data. That in turn suggests that it will work with some kind of Apple-made FitBit device. 4) Apple has already shown that it can work with third parties to make iOS-compatible hardware. AirPlay, CarPlay and iBeacon are all ways to make the iPhone and iPad play with the outside world. Now, imagine that Apple makes an iWatch spec, along with a chip, that can be added to a regular watch, making it compatible with your iPhone. For the sake of argument, let’s say it’s my Casio calculator watch. Thus, my Casio would be able to track my steps, my altitude, the direction I’m walking in, and tell that to my iPhone, and the iPhone would then combine this with its own location data. My Casio would monitor my heart rate and whatever else a wrist-mounted sensor can drag out of my body, and it would send it to the iPhone on request. And because there’s no display, or Wi-Fi, or other power-hungry hardware, it runs for months. Who wants to recharge a watch every night, right? The existing grayscale LCD of my Casio could easily support some basic extras, too. Caller ID and that kind of thing. And you could use the watch’s buttons to speak back to the iPhone, all without any big battery drain. Think about it. 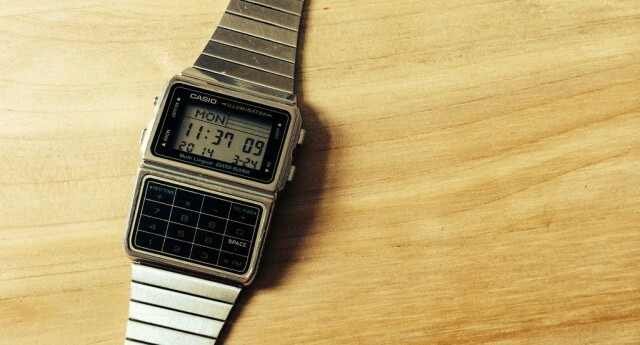 Apple’s launch could even involve someone from Casio, showing off their new iCalculator watch. Maybe someone from a big Swiss watch maker would be there too. A Rolex which talks to your iPhone would be pretty neat. Apple wins by making your iPhone even more useful than it was before, and nobody has to buy one of those vaporware Android watches. And I think Apple might even make a device that showcases the tech. It wouldn’t be a watch, though. It would be the new iPod nano, with the M7 chip. Just like the old clip-on nano only better, and with a wrist strap. Is this likely? Who knows? But it solves several problems which come up every time we talk about an actual physical iWatch. Watches are about fashion and almost nothing else, but Apple usually only makes one product in each category (ignoring storage differences and so on), and then in just a few colors. It solves the problem of a battery-sucking display – there’s no display required. And it nicely integrates iOS into the watches you already love. I’d totally buy a new Casio calculator watch if it worked with my iPhone, but I can’t see myself buying an iWatch to wear instead of my existing one. If you disagree, hit me up on Twitter.